Oh Mr. Sun, Sun, Mr. Golden Sun, Please shine down on me ..... *singing kids song*. It has been raining a lot today, really a lot. Dark sky again for today. FYI, we only have 2 seasons in Indonesia, the rainy season is usually hitting the peak rainfall between January and February. So no wonder if the sun was hiding and reluctantly to come out today. 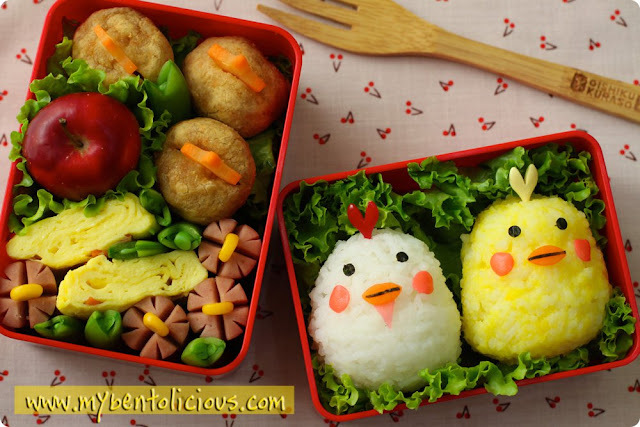 For today's bento, I made 2 chickens from rice ball molded with hand. The rice ball stuffed with cooked chicken mince meat. Forgot to stock some crab sticks in my fridge and couldn't find pink-white kamaboko at the supermarket. It leaved me with no choice but to use red egg sheet for the cheek of the chickens. I used two layers small bento box this time. And as you can see the other box filled with 3 fried chicken balls and carrots on the top, a small Korean apple, 2 tamago, and sausages. I also put some pea pods to fill the empty room in the box. I found the small Korean apple is perfect for bento. It is so small, so we can put it inside the bento box. My daughter love this apple a lot but unfortunately this apple is imported and will be hard to have it for all seasons. Please check on BENTO CENTRAL for more information about bento. You can even submit your bento there. Have fun with your bento!! Adore the chicks! Hope the sun comes out for you soon. Another new creation, very cute. You mentioned red egg sheet~ is it beaten egg with red colouring? The little apple is so perfect for bento! It must be hard to have so much rain, I can't imagine! this is so beautiful! the little chicks are just so adorable! My boy learned that song in preschool too, hehe! Your mini apple is from Korea? Ours is called lady apple; I don't think they are imported; they are quite inexpensive here. @sherimiya : Thanks Sheri! Most of the apples are imported. We have local grown apple but the taste is not so nice. Maybe because Indonesia is tropical country so fruits such as apple, berries, kiwi, peach, plum, grape, ... (what else?) are all very expensive. I remember from my last trip to Melbourne that one small box of blueberry cost only AUD 2 (equal to IDR 16,000) but in Jakarta that will cost us IDR 80,000 (equal to AUD 10). @Kids Dream Work : Thanks for the comment! Will be great if you have that small apple because it is so small. You don't need to slice it, just put it in the box. Therefore no need to soak it into salt water or afraid will turn brown. Hope you can find it later, who knows? I like the red cheeks! Makes a very sophisticated Mr. and Mrs. Chicken!